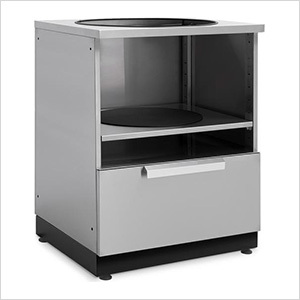 The Outdoor Kitchen Kamado Cabinet easily supports the heaviest ceramic grills, with plenty of additional storage space and unique features to elevate your culinary techniques. The built-in, height-adjustable reinforced shelf, and adaptable trim rings work together to accommodate 16 in. to 24 in. kamado grills, creating a seamless, custom-looking Kamado support. A honeycomb, heat-resistant mat disperses heat evenly, keeping the shelf cool, even at extreme temperatures.